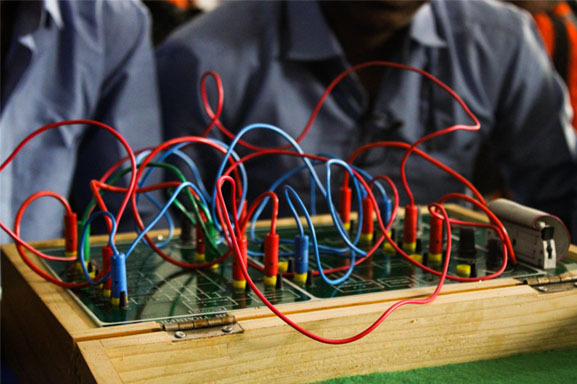 The Department of Electronics and Communication Engineering was started in the year 2007. The department offers BE programme in Electronics and Communication and ME programme (VLSI Design) with a vision to produce globally competent professionals. 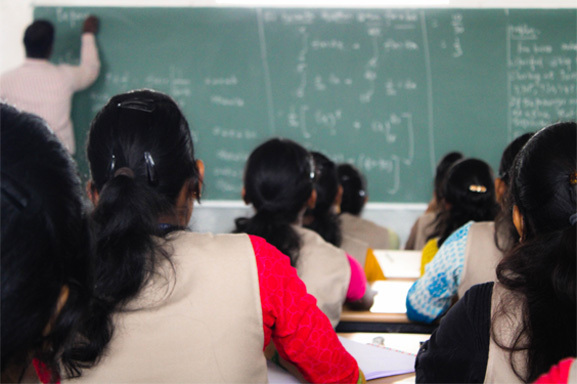 The department has 6 spacious and well-equipped state of art laboratories and smart classrooms. The department has highly qualified and rich experienced faculty members coupled with young talents and supporting staff. The Department got its Research Centre Recognition from Centre for Research Anna University Chennai. The department has secured 11 university ranks and One Gold medal from the year of establishment. The department has received financial support from leading funding agencies like ISRO, ICMR, CSIR, BRNS, DST, DRDO, AERB, IEI, TNSCST etc., for carrying out research projects and also Technical events. The department has established Professional bodies like IETE, IEEE, ISTE and IEI student’s chapters. The department has established two Centre of Excellence in the field of Embedded Systems in association with TEXAS and PLC and SCADA in association with Siemens powered by GENN Automation. To develop value based professionals with a strong foundation in Electronics and Communication Engineering and innovative technical skills with eminent leadership qualities and ethical conduct. MD1: To establish a conducive and inspiring learning environment towards value based education. MD2: To educate the students with the state of art technologies to meet the growing challenges of the industry and to guide them towards research in varied fields of Electronics and Communication Engineering. MD3: To provide a quality system for wholesome learning to achieve progress and prosperity in life along with moral values. PEO1: Graduates will possess innovative ideas to, design,simulate, develop and test software and hardware components to offer solution in modern engineering applications. PEO2: Graduates will work effectively in a multi-disciplinary environment and individually, within a global, societal, and environmental context. PEO3: Graduates will inculcate in professional ethics and codes of professional practice for succeeding in professional career. PSO 1: The graduate will be able to apply the knowledge of Engineering and Management principles to manage projects as a team member or leader in multidisciplinary teams. PSO 2: The graduate will be able to lead in their professional disciplines, organizations and communities around the world. PSO 3: The graduate will engage themselves in lifelong learning to follow developments in the field of Electronics and Communication Engineering. PO1: ENGINEERING KNOWLEDGE: Identify, formulate, review research literature and analyze complex engineering problems reaching substantiated conclusions using first principles of mathematics, natural sciences, and engineering sciences. PO2: PROBLEM ANALYSIS: Ability to analyze and develop solutions to computational problems using appropriate algorithms. PO3: DESIGN /DEVELOPMENT: Design solutions for complex engineering problems and design system components or processes that meet the specified needs with appropriate consideration for the public health and safety, and the cultural, societal, and environmental considerations. PO11: PROJECT MANAGEMENT AND FINANCE: Demonstrate knowledge and understanding of the engineering and management principles and apply these to one’s own work, as a member and leader in a team, to manage projects and in multidisciplinary environments. PO12: LIFE LONG LEARNING: Recognize the need for, and have the preparation and ability to engage in independent and life-long learning in the broadest context of technological change. 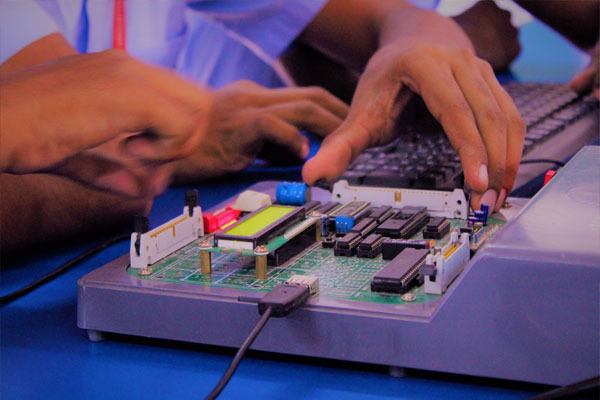 This Centre of Excellence provides training on embedded systems so that students can meet the industry standards and can make projects based on the embedded systems. This COE has latest microcontroller units of Texas Instruments on which students can perform hands on experience. The main objective of setting up this Coe is to provide a bridge between industry and academic needs. Also the purpose of setting up this COE is students will be able to design, describe, validate and optimize embedded electronic systems in different industrial application areas. The PLC laboratory is setup to complement the topics studied in the automation theory course. 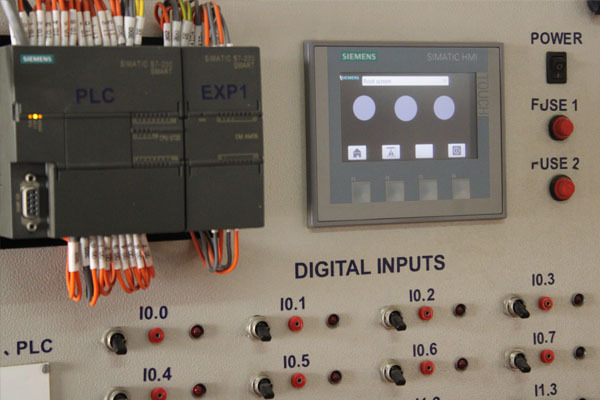 The lab is equipped with PLC automation trainer kits and modules to enable the study of components of automation system. 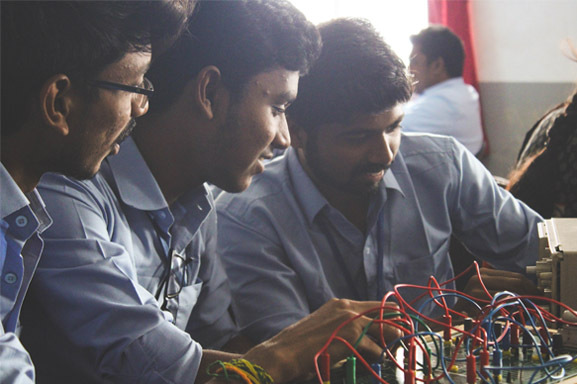 The students perform experiments to study the components of PLC, programming PLC, interconnection of PLC with computer, SCADA programming and fault detection in automation system. A PLC (i.e. Programmable Logic Controller) is a device that was invented to replace the necessary sequential relay circuits for machine control. The PLC works by looking at its inputs and depending upon their state, turning on/off its outputs. PLCs are used in many "real world" applications. SCADA systems are now used in the controls of ancillary systems such as cooling, ventilation, power distribution, etc. and have made substantial progress over the recent years in terms of functionality, scalability, performance as well as openness, such that they are an alternative to in-house development even for very demanding and complex control systems. Demonstrating the basic principles in the area of strength and mechanics of materials and structural analysis to the undergraduate students through a series of experiments is the objective of the strength of materials lab. Measuring the properties of the materials such as impact strength, tensile strength, compressive strength, hardness, ductility are conducted in the lab.Major Equipments Strength of Materials Lab:- Universal testing machine, Torsion testing machine, Impact testing machine, Brinell hardness testing machine, Rockwell hardness testing machine, etc. 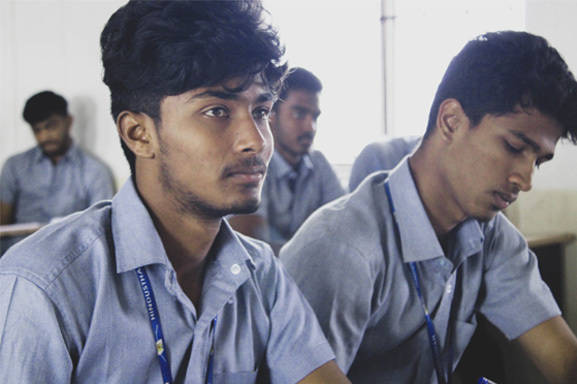 The DSP/ VLSI laboratory is well equipped with the most up-to-date industry standard DSP and VLSI EDA tools and hardware resources like MATLAB software with various Tool boxes and Simulink, Xilinx 12.1,ModelSim Tanner EDA tool, CADENCE Tool, QCA Designer Tool, TMS 320C5416,Spartan3 FPGA, Logic Analyzer, DSO,ADC/DAC Kit and CPLD. The laboratory provides a platform for the students and researchers to study and explore both hardware and software techniques in the field of Digital Signal Processing and VLSI. Undergraduate and Postgraduate students to implement Real-time project work in areas like Low Power VLSI, Signal Processing and Image Processing. 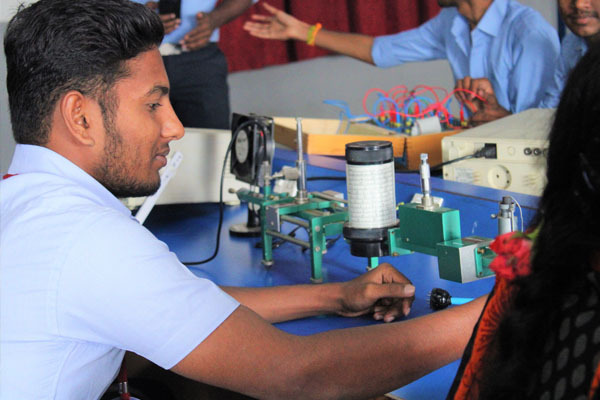 The Electrical Engineering Laboratory has efficient learning facility designed to provide electrical engineering students with hands-on experience in the basic machineries employed in industry. The lively learning environment that can house 45 students and teaching staff. Each work station is equipped with the latest electrical engineering technologies .Additionally, the laboratory also has a learning and breakout zone to encourage students and staff to work collaboratively. Developing state-of-the-art machines and monitoring and diagnostics technologies to enable faster, greener ways to power build and move the world. This is the lab where experiments like load test on various machines, speed control tests, open circuit tests, short circuit tests are carried out. And also wide varieties of practical experiments are performed here with grouping of different rotating machines. The laboratory is also used for exploration activities in machines and to carry out project works on energy conversion. All basic electronic devices and their characteristics, applications can be studied. Using these devices, the small electronic circuits and mini projects can be constructed and checked. 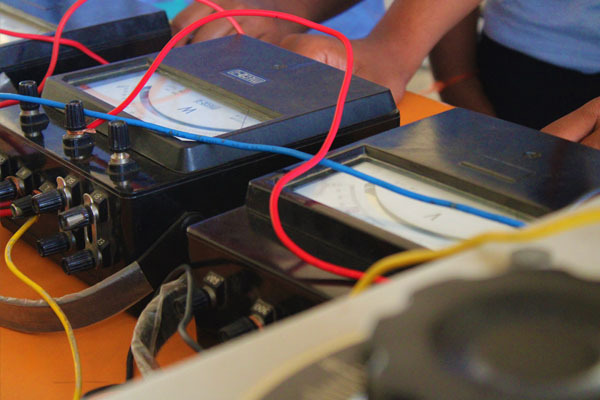 In order to introduce the students with basic components of electronics this lab is furnished with advanced CROs, function generators and digital multi meters. Students can perform practical on P-N junction diode, Zener Diode, rectifiers and filters, transistor biasing and their characteristics in different modes, RC coupled amplifiers and FETs. The Microprocessor Laboratory aims in inculcating the knowledge of programming skills by executing various programs like arithmetic operations, code conversions, searching and sorting algorithms studied in the Microprocessor and Microcontroller.Students from other branch of engineering and sciences also come to this lab and develop their skills in the field of microprocessor and its applications.The features and facilities available in this lab will help the students do their projects and enhance their knowledge about the latest trends and technologies. The students have in depth knowledge in writing and executing 8086 8085 and 8051 Assembly Language programs. Microprocessor laboratory is equipped with microprocessor kits and interfacing devices.The students achieve encoding skills in Assembly Language and Interfacing with various devices. Network laboratory is designed & developed considering the curriculum offered by Anna University. Trainer kits utilized in the network laboratory are designed for students at all level to study and understand all the concepts of data communication, data transfer using serial and parallel ports, Ethernet and wireless LAN with complete protocol understanding and actual hands on with hardware & software with ease. This lab provides facilities to study about Network protocols, Communication between PCs, Routing protocol. In Networking Lab, students will develop knowledge of the concepts and skills related to telecommunications and data networking technologies and practices to apply them to personal or career development. The Communication Systems Laboratory has been equipped with Digital Function generator, Pulse Code Modulation kit, Pulse Code Modulation kit AM/FM transmitter and receiver kits and many other experimental kits. Communication systems laboratory focuses on training the students in both analog and digital transmission/reception of signal. The students here start in the analog area by constructing the circuits of amplitude modulation, frequency modulation and phase modulation. Communication systems Laboratory is catering to the needs of facilities in communication field by training its students to make valuable contribution. This lab is used by B.E students of different branches like Electronics & Communication, Information Technology. He received his Ph.D. in Digital Signal Processing, Approach for De-Noising from EEG signal from Anna University Chennai, M.E degree in Applied Electronics from PSG College of Technology, Coimbatore, affiliated to Anna University Chennai, TamilNadu and B.E degree in Electronics and communication Engineering from National Engineering College, Kovilpatty, affiliated to Anna University Chennai, Tamilnadu. He has two decades of Teaching and Research experience in various institutions. He presently holds the position of Professor & Head in the department of ECE, Hindusthan institute of technology Technology, Coimbatore. He is a pioneer in the fields such as Image Processing, Signals and Systems, Digital Signal Processing, Medical Image Processing and Optimization Techniques. He has published Six books, and has published around 55 research papers in International journals. He has reviewed many National and International level books and journals. He is a proud member of various professional bodies such as Institution of Engineers IE(I), IEEE ( Member), Indian Society for Technical Education ISTE (Life Member),International Society of research and Development(ISRD),Institute for Exploring Advances in Engineering (IEAE), International Association of Engineers (IAENG) . He is currently guiding research in image processing, signal processing and soft computing. He has contributed as a principal investigator in various projects funded by the DST, IEI, TNSCST, etc. She is a Master in Applied Electronics and a Ph.D. in Information and Communication Engineering from Anna University, Chennai. She has over 18 years of teaching experience and currently works as a Professor at ECE Department, Hindusthan Institute of Technology. Her area of interest includes Wireless Communication, Embedded Systems and Wireless Networks. She has published many papers in International and National Journals and Conference. She has organized two International Conferences, one National Conference, many workshop, symposium and seminar. She is a life member of ISTE, IETE and IEANG. He completed his B.E. in Electronics and Communication Engineering in the year 2003 from Sun College of Engineering and Technology, Nagercoil. He did his M.Tech degree in Computational Engineering and Networking at Amrita Vishwa Vidyapeetham, Coimbatore during the period of 2004 to 2006. He obtained his doctoral degree from Anna University, Chennai in the year 2018. He had received “Innovative Professional Award” from Society of Professional Engineers. He is one of the Co-principal investigators of research project sponsored by Department of Science and Technology, New Delhi. His area of research interest includes Medical Image Processing, Networking and Signal Processing. He holds TÜV Rheinland certification for conducting ISO internal auditing. He has published more than 35 research articles in various international and national journals and conferences. He has more than 14 years of experience in teaching and research. He completed her B.E. in Electronics and Communication Engineering from RVS College of Technology, Dindigul (Madurai Kamaraj University) in the year 2001. He completed M.E. in VLSI Design Anna University of Technlogy, Coimbatore (in the year 2009. He is pursuing his PhD in Anna University, Chennai in Low Power VLSI Design. His area of interest include Digital Electronics, Low power VLSI. He has fetched fund from IEI for student project proposal. He has published many research papers in reputed International Journals and Conferences. He is a life member in ISTE, IAENG and IRED. He is an associate professor in the department of Electronics and Communication Engineering. He had received his B.E (ECE) degree with first class with distinction from Hindusthan College of Engineering and Technology, Coimbatore in the year 2004 and M.E-Applied Electronics from Maharaja Engineering College, Avinashi in 2009.. He is currently doing his research in the area Low power VLSI Design. He has published many papers in International and National Journals and Conference. He has organized one National Conference, many workshop, symposium and seminar. He is a life member of ISTE. He has received funds from various organizations like DST-ICPS, BRNS and DRDO-NRB . He has totally 14 years of teaching experience. She received her M.E degree in VLSI in the year of 2011 and B.E degree in Electronics and communication Engineering from Periyar Maniayammai College of Engineering and Technology for Women, Thanjavur, Tamilnadu in the year of 2003.Now she is working as an associate professor in the department of Electronics and Communication Engineering. She is currently doing her research in the area Low power VLSI Design. She has presented many papers in various national and international conferences and journals.Her area of interests is image processing, Signal Processing and VLSI Design. He received his B.E degree in Electronics and communication Engineering from A.C College of Engineering and Technology, Karaikudi and M.E degree in Communication Systems from PSG college of Technology, Coimbatore. Currently He is pursuing Ph.D. in Anna University, Chennai. He received his B.E degree in Electronics and communication Engineering from Hindusthan College of Engineering and Technology, Coimbatore and M.E degree in Communication Systems from VLB Janakiammal college of engineering and technology, Coimbatore. Currently he is pursuing Ph.D. in Anna University, Chennai. He received his M.tech degree in Computer and Information Technology from M.S.University, Tirunelveli, and MBA from Annamalai University, Chidambaram and B.E degree in Electronics and Communication Engineering from St.Xaviers Catholic college of Engineering, Nagercoil, affiliated to Anna University Chennai, Tamilnadu. His area of research includes Digital Image Processing and Embedded Systems. He is a member of ISTE and IAENG. He has received funds from various organizations like DST, ICMR,BRNS,DRDO,AERB. He has totally 10 years of teaching experience. He has published a book named “Analog and Digital Communication”. He received his M.E degree in embedded system technologies from KSR College of Engineering, Namakkal, Tamil Nadu and B.E degree in Electronics and Communication Engineering from Nandha Engineering College, Erode, affiliated to Anna University, Chennai. He is one of the Co- investigators of research project sponsored by Department of Science and Technology, New Delhi. His research interest includes Signal Processing and Image processing. She received her M.E degree in Applied Electronics, B.E degree in Electronics and Communication Engineering from Government College Technology, Affiliated to Anna University, Coimbatore, Tamilnadu and Diploma in Electronics and Communication Engineering from Nachimuthu Polytechnic, Pollachi. He is currently working as Assistant Professor in the department of Electronics and Communication Engineering at Hindusthan Institute of Technology. He completed his B.E. in Electronics and Communication Engineering in the year 2012. He completed his M.E in the year 2014. He completed his B.E. in Electronics and Communication Engineering in the year 2009 from Bannari Amman Institute of Technology, Sathyamangalam. He did his Masters in Communication Systems at Kumaraguru College of Technology affiliated to Anna University. He is one of the Co-principal investigators of research project sponsored by Department of Science and Technology, New Delhi. His area of research interest includes Antennas, RF and Communication Systems. He has published more than 30 research articles in various international and national journals and conferences. He had established Centre of Excellence in association with Siemens in the field of PLC and SCADA. He is a Master in Applied Electronics from Kongu Engineering College, Erode, Anna University in 2009. He obtained his B.E. (ECE) from Bannari Amman Institute of Technology, Sathyamangalam, Anna University in 2005. He has 10 years of teaching Experience in Digital Design and Microprocessor and Microcontroller. His research interest includes Embedded System Design and Networking. He is a Life time Member in IETE, ISRD, CSTA, IRED and IAENG. He has published 4 International Journals and presented many papers in various National and International Conferences. She is currently working as Assistant Professor in the department of Electronics and Communiation Engineering at Hindusthan Institute of Technology. She completed her B.E. in Electronics and Communication Engineering in the year 2013. She completed her M.E in the year 2015. He is currently working as Assistant Professor in the department of Electronics and Communication Engineering at Hindusthan Institute of Technology. He completed his B.E. in Electronics and Communication Engineering in the year 2008. He completed his M.E in the year 2014. 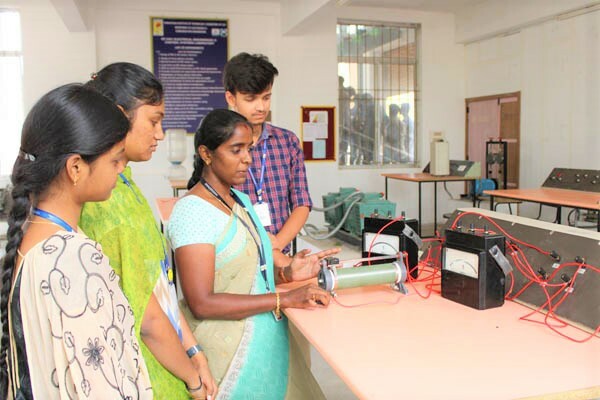 She completed her B.E in Electronics and Communication Engineering in the year 2014 and M.E., in Communication systems in the year 2016 from Dr.Mahalingam college of Engineering and Technology. Her research interest includes Communication Systems and Antenna & Microwave Engineering. She is currently working as an assistant professor in the department of Electronics and Communication Engineering. She completed her B.E (ECE) degree with first class from Einstein College of Engineering, Tirunelveli in the year 2012 and M.E-Communication Systems from KNSK College of Engineering, Nagercoil in 2014 and secured 48th rank under Anna University. She is currently doing her research in the area Medical Image Processing. She has presented many papers in various national and international conferences and journals. She has also received fund from TNSCST under student project proposal scheme. She has an academic experience of 11 years in teaching.She obtained her B.E. (ECE) from Sri Krishna College of Engineering and Technology in 2005. She received her M.E. (Communication Systems) from Anna university of Technology,Coimbatore in 2013. Her area of interest includes Communication Systems and Digital Image Processing.She is a life member of ISRD. She has completed her BE- ECE in 2006 and ME – Communication Systems in 2012. She takeaway her research effort in the field UWB micro-strip patch antenna for WBAN applications. She published two of her research works in IEEE International Conferences. He received his M.E Degree in VLSI Design from Info Institute of Engineering, Coimbatore and B.E degree in Electronics and Communication Engineering from Hindusthan College of Engineering and Technology, Coimbatore. His research interest includes VLSI Design, Signal Processing and Image Processing. He has published 3 international journals and one national journal. He is a member of IETE and IACSIT. He has received Seminar Grant fund from CSIR. He has totally 4 years of teaching experience. She has completed B.E., Electronics and Communication Engineering from Hindusthan College of Engineering and Technolgy, Coimbatore in 2016 and M.E., Communication Systems from Kumaraguru College of Technology, Coimbatore in 2018. Her research interest includes Antenna & Microwave Engineering and Wireless Communication. Her research publication includes 3 International Journals. In-plant Training & special Technical Training. Mini Projects and Main Project Work.